Pino’s wine store near Hoofddorpplein is quickly turning into a complete source of Italian drink, food and lifestyle. Pino opened his store on Haarlemmermeerstraat about a year ago. He started by offering a great selection of Italian wines, built through many years as a wine supplier to many great Italian restaurants in the Netherlands, and then also made available directly to consumers. I was very happy when Pino added freshly prepared take-away pasta to his selection, providing quality meals at a very affordable € 5,= per person. Next to good food, there was always a great story to be shared and some excellent wine to be tasted and I quickly became a regular. Little did I know that things would get even better. Two weeks ago I went for pasta and ended up with an amazing burrata, imported directly from Italy by Pino along with tomatoes, buffalo mozzarella and all the other ingredients he needs for his pasta. Since burrata must be fresh, it’s not available every day. But make sure you ask for it when you stop by! Last Friday, Pino added two pizza ovens to the kitchen and hired a pizzaiolo to work alongside the pasta chef. Which means you can now also enjoy freshly made take away pizza. Starting at € 6,50 there is a number of standard pizzas like margarita and funghi, as well as more interesting varieties like San Daniele with cured ham or Buffalina. 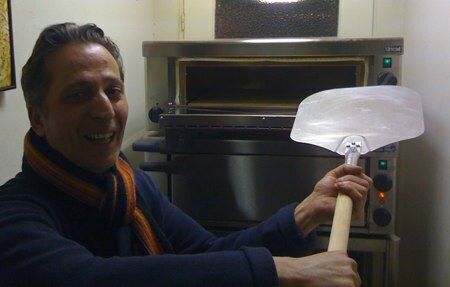 I’m very happy about this and as you can see from the photo, Pino is very proud of his pizza ovens and peel! Glad you liked the suggestion. Curious if you have tried any of the recommendations and what you thought about them! Great pizzas. Great owner. Great selection of wines.